See listings here for today and here for ongoing events. Architectural History of the Albert Hall: Pretty self-explanatory. Take a guided tour round the old, red beehive for £7.50. Tours from 11am, requires booking. Pub and Church Crawl: From holy spirits to those of the distilled kind, this tour of Clerkenwell’s historic boozers and churches is led by former RIBA president Maxwell Hutchinson. £7, booking required. Building the Gherkin: Documentary on the construction of everyone’s favourite pickle-shaped skyscraper introduced by Lord Foster. £11, booking required. Open Practice: During the festivities, many architects are opening their doors to the public. Midweek, you can wander round the offices of four smaller practices Chetwoods (Brixton Tube refit, and the ‘urban oasis’ sculpture now showing on Clerkenwell Green), Eric Parry (London Bridge ‘spike’, Aldermanbury Square), Jeff Kahane (private flats) and Alford Hall Monaghan Morris (Barking town centre, Barbican refit). This is your chance to have a one-to-one with architects, usually over a glass of wine. Extreme Shopping Race: ‘With a shopping list and a map, teams of 2-3 people will race to locate daily essentials in two different urban landscapes’. Sounds bonkers. £10, prebook. 1960s Architecture: Icon or Eyesore? : The case for and against, argued at the Tate Modern from 12.30. This one’s free, and you can just turn up on the day. Norman Foster and the British Museum: One of several free, lunchtime gallery talks at the museum. No booking required. Peter Ackroyd Sacred Thames: Lecture by the big man at Tate Modern (£18). If you can’t get tickets, have a wander across the Millennium Bridge, where Ackroyd’s words are pasted to the handrails. Borough Market Feast: It’ll cost you £30, but it sounds worth every penny. A handsome feast with catering by a Masterchef winner, live music, and food from local traders. Requires booking. See the official website for booking details and further events. More to come on Thursday, when we look forward to the weekend. 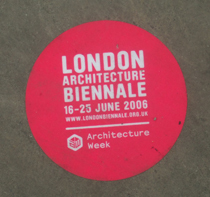 Image taken by M@, showing one of the wayfinding stickers between Clerkenwell and St Pauls.